Also serving communities of Bealeton. There are 4 Assisted Living Facilities in the Warrenton area, with 2 in Warrenton and 2 nearby. The average cost of assisted living in Warrenton is $5,495 per month. This is higher than the national median of $3,346. Cheaper nearby regions include Manassas with an average starting cost of $4,015. To help you with your search, browse the 19 reviews below for assisted living facilities in Warrenton. On average, consumers rate assisted living in Warrenton 4.0 out of 5 stars. Better rated regions include Manassas with an average rating of 4.2 out of 5 stars. Caring.com has helped thousands of families find high-quality senior care. To speak with one of our Family Advisors about assisted living options and costs in Warrenton, call (855) 863-8283. Located to the east of the Blue Ridge Mountains, Warrenton, Virginia is surrounded on all sides by wine and horse country. It is a great town for those who love living with nature, including seniors who live in one of the 10 assisted living facilities in the area. Two of these facilities can be found within Warrenton itself, while the other eight can be found in nearby towns. All assisted living facilities in Warrenton and the rest of Virginia are regulated by Virginia's Department of Social Services. The cost of living in Warrenton is 9 percent higher than the Virginia average. It is also 17 percent higher than the national average. This means that seniors may find goods and services, as well as the taxes on these goods and services, to be less affordable than in other cities. The crime rate in Warrenton is 20 percent lower than the national average. Safety-minded seniors may find that they feel more secure here than in other areas. The Warrenton area is home to world-class medical facilities, including the Fauquier Health Hospital, in the event of medical emergencies or illness. The weather in Warrenton is fairly mild. The high temperatures usually remain in the 50s during the cooler months, and they don't normally exceed the 80s in the summer months. There is, however, a high amount of precipitation in Warrenton every year, with June typically seeing over nine inches of rain. This could make it difficult for seniors who enjoy spending their time outside. The air quality in Warrenton is 25 percent better than the national average. The pollution level is also 76 percent better than the national average, making it an ideal place for seniors with respiratory conditions like COPD or asthma. Transportation options for seniors in Warrenton are provided by Rappahannock Rapidan Community Services (RRCS) and include buses, door-to-door ride services, and more. Assisted Living costs in Warrenton start around $5,495 per month on average, while the nationwide average cost of assisted living is $4,000 per month, according to the latest figures from Genworth’s Cost of Care Survey. It’s important to note that assisted living rates in Warrenton and the surrounding suburbs can vary widely based on factors such as location, the level of care needed, apartment size and the types of amenities offered at each community. 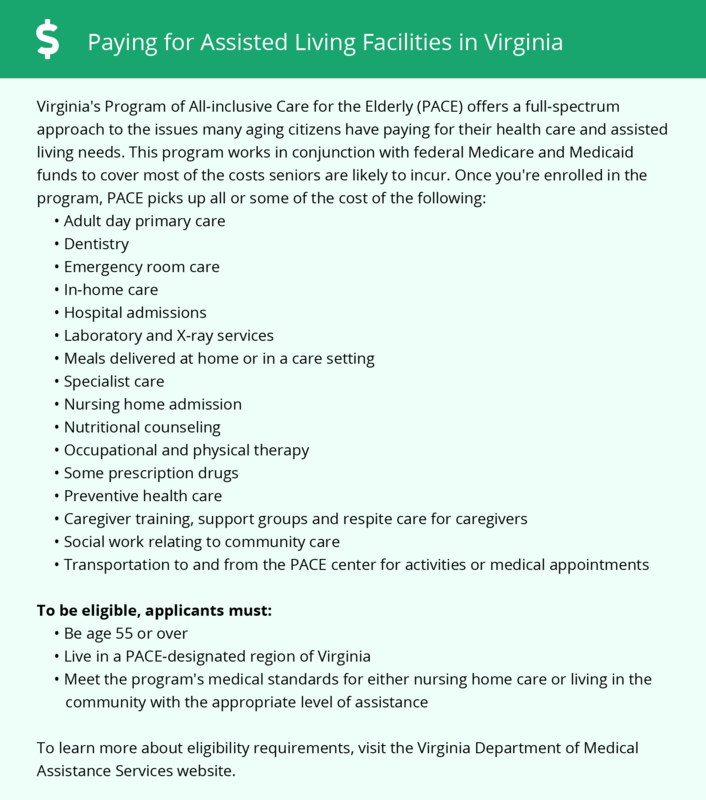 Eligible seniors in Warrenton and other cities in Virginia can apply for an Auxiliary Grant to help pay for assisted living. Warrenton and the surrounding area are home to numerous government agencies and non-profit organizations offering help for seniors searching for or currently residing in an assisted living community. These organizations can also provide assistance in a number of other eldercare services such as geriatric care management, elder law advice, estate planning, finding home care and health and wellness programs. To see a list of free assisted living resources in Warrenton, please visit our Assisted Living in Virginia page. Warrenton-area assisted living communities must adhere to the comprehensive set of state laws and regulations that all assisted living communities in Virginia are required to follow. Visit our Assisted Living in Virginia page for more information about these laws.